Monthly payments can be a huge pain when running a business. Getting out from under leasing companies can be a great relief when you are trying to turn a profit. 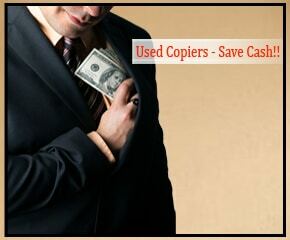 This is why more and more people are looking into purchasing used copiers. We offer a wide variety of products from trusted names like Copystar, Kyocera, and Ricoh. All our copiers are in great working condition and offer all the features you need to conquer your print and copier needs. Our copy machines are guaranteed to do the jobs you need them to. Some people are concerned about purchasing used office machines. They are worried that they may be inheriting someone else’s problem and will be stuck with a broken machine. You won’t have to worry about that at Fort Worth Copier. Our used copiers are in great condition because they come from businesses that previously maintained their copiers. The businesses that had the copier first took care to make sure that their lease stayed in contact. We pride ourselves on offering the best used copiers in Fort Worth. Give us a call today if you think that a used Copystar, Kyocera, or Ricoh copier is the right choice for you. We are more than happy to get your set up with a great copier for a great price. Don’t hesitate, and call Fort Worth Copier today.